On November 28, 2016 the Consumer Finance Protection Bureau (CFPB) issued a bulletin warning supervised financial companies that creating incentives for employees and service providers to meet sales and other business goals can lead to consumer harm if not properly managed. 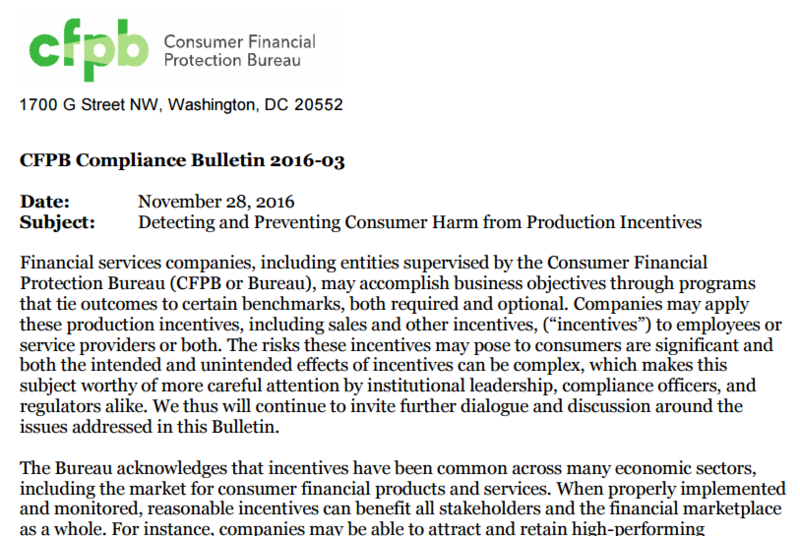 The bulletin didn’t create any new regulations but does give “The CFPB’s Expectations” for institutions who choose to utilize incentives. The CFPB stated: “To limit incentives from leading to violations of law, supervised entities should take steps to ensure their CMS is effective”. The regulatory agencies haven’t followed up with their own guidance or expectations, but if your institution has a cross-sell or incentive program for your employees, you should familiarize yourself with these expectations and move toward incorporating them in your systems. If you’d like to discuss further what’s expected or would like someone to review your incentive program, ABS is here for you. Give us a call at 866-931-4682. Click here to read the entire CFPB bulletin. Are Your Meetings Productive? We knew this was coming!